ingrediens i kosmetik & kemisk-tekniske prod. Du kan hente vore seneste opdaterede prislister gældende for momsregistrerede erhvervskunder. Prislisterne kan downloades i PDF-format. Med den gratis Acrobat Reader® -software kan du læse og udskrive Adobe PDF-filer. Jet-Lube yellow grade metalfri antiseize, pipe dopes / lubricants. Prisblad 53 Kølekompressorolier Suniso 3 GS 4 GS 5 G og Suniso SL 32 m.fl. RTV Silicone 1 komponent sealants , aceotoxy cure & electronic grades. Fully synthetic lubricating engine oil, especially developed for the long time protection of the emission system of the modern car and to keep the efficiency of the emission reduction system. Full synthetic engine oil, specially developed to meet the VW 505.01 specification. For all modern gasoline-, LPG- and diesel engines, equipped with DPF and/or SCR, for which an ACEA C3 and SAE 5W40 engine oil is prescribed. Advanced performance fully synthetic LongLife oil, to be used in all modern types of automobile engines. Ideal optimum energy/emission efficiency and improved environmental protection. State of the art, full synthetic engine oil specially developed for the latest, most demanding diesel- and gasoline engines. Universal oil based on the finest high viscosity base oils and the most specialised additives. Flagship, fully synthetic lubricating engine oil, particularly developped for the most demanding working circumstances. Especially suitable for use in cold weather areas as well as resistant to high environmental temperature operations. Fully synthetic lubricating turbo engine oil for the most demanding working circumstances and during all seasons. Particularly suitable for use in cold temperature regions. Fully synthetic, long life, fuel economy engine oil for VW/Audi engines subjected to extended maintenance interval operation, according to "VW Norm 503.00/506.00/506.01". Latest generation line of synthetic engine lubricants, for practically all passenger cars, gasoline, diesel and LPG fueled and during all seasons and in practically all circumstances. Excellent anti-wear properties, prevents black sludge and catalyst compatible. SYNTURO RACING SAE 10W60 is the oil for the competition driver. Fuel economy semi synthetic "low viscosity" engine oil for gasoline, diesel and LPG engines of some latest "high-tech" engines in modern passenger cars. "Energy conserving API SJ". Particulary recommended for many Ford and a number of Renault and PSA diesel and gasoline engines. Unique, carefully fine-tuned, fuel economy, "low viscosity" type engine oil for gasoline and diesel fueled cars and light duty vans, this for whole years use. Excellent, latest state of the art, semi-synthetic blend turbo motor oil! Reliable, all season lube for the highest possible performance, providing longer life for turbo engines and the benefits of API SL quality. Approvals MB 229.1, VW 500/505, Saab, Porsche and BMW. Engine lubricant without additives, used in older, highly consuming engines or where non-detergent type motor oil is required. Useable for gasoline and diesel engines. 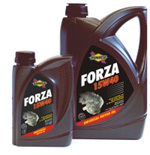 High quality engine oil blended with synthetic base oil, suitable for virtually all turbocharged and naturally aspirated engines of passenger cars and light commercial vehicles, working under severe circumstances including those with high mileages under the bonnet (particularly in those car and light van engines with a mileage above 100.000 km!). Latest state of the art mixed fleet multigrade oil, meeting the highest API engine oil standards. Suitable for "Euro 4 emissions" trucks operating on lowest possible sulphur fuels as well as for many passenger car engines. Top tier mixed fleet multigrade oil, complying with current heavy duty diesel lube specifications as well as qualifying for passenger car diesel and gasoline engine applications. Suitable for EURO II diesel engines operating on low sulphur fuels. Extended drain intervals. Excellent anti-wear properties, preventing black-sludge, limiting bore polishing and catalyst compatible. Perfo level: MB 228.1, MB 229.1, VW 505.00, VOLVO VDS, MAN 271 and ALLISON C-4. Superior multigrade oil of the highest quality for gasoline engines. Also suitable for virtually all diesel passenger cars. Universal mono- and multigrade oil meeting the requirements of major engine builders for turbo-charged or naturally aspirated engines. Also suitable for certain(older type) gasoline engines. Universal oil for a mixed fleet of cars. Super high performance diesel engine oil. Extended oil drain intervals. High diesel performance level, ideal for engines working under severe conditions and subjected to high temperature variations. Superb motor oil for heavy truck engines. Approvals: MB 228.3, MAN M 3275, VOLVO VDS-2, KHD, PERKINS, DAF, SCANIA LONG DRAIN. Newest highly powered fuel economy heavy duty diesel engine oil, specially developed to meet the most stringent European EURO-4 lubrication requirements. The oil can also be used in the EURO-2 and 3 engines. UHPD oil based on "low SAPS" technology, meeting the most stringent European diesel engine oil requirements. Euro HPD is specially suited for use in EURO-4 engines in combination with low sulphur diesel fuel. 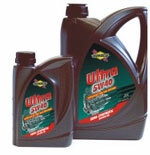 Ultra high performance diesel engine oil for super long drain intervals. Classified ACEA E4. Furthermore approved MB 228.5, VOLVO VDS-2, MAN M 3277 and approved SCANIA LDF. Fully synthetic heavy duty type engine oil for fuel economy and super long drain intervals. Highly detergent, top quality monograde oil providing longer drain periods, real long life. Special low ash oil for "DETROIT/GM/DDA/DDC" 2 stroke diesel engines. Lubricating oil for all turbo charged and naturally aspirated diesel engines in passenger cars, trucks, busses and machinery, all working under severe circumstances. Also excellent transmission oil for a lot of equipment. Upper tier, semi-synthetic, low smoke type, two stroke motor oil for pre-mixed as well as for injection system use. Basic line general use, non self mixing quality for classic type two stroke engines. 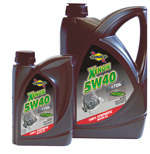 TWO STROKE SNOW and SYNSNOW - Snowmobile Oils. top tier, semi-synthetic (SNOW) and fully synthetic diester base type (SYNSNOW), low smoke/low ash, highly performant 2 cycle snowscooter motor oils for "pre-mixed" as well as for injection system use. Modern, fully synthetic and biodegradable top two cycle engine oil. Advisable for both airand water cooling, particularly in case of high potential oil spilling risks. Bearing and cylinder oil for trunk piston engines when a gas oil or marine diesel fuel with a high sulphur content is used. Engine oil applicable in modern trunk piston diesel engines working on heavy fuel. In crosshead engines working on gas oil or marine diesel fuel to lubricate the cylinder. Lubricant for trunk piston engines using heavy fuel with a high sulphur content. 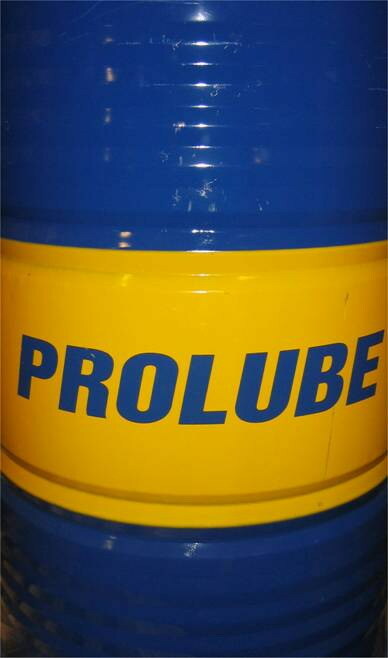 Cylinder lubricant for crosshead engines running on gas oil and marine diesel fuel with a high sulphur content. A high alkaline cylinder oil for bigger crosshead diesel engines using heavy fuel with a high sulfur content. Oldtimer=before 1935 * Classic cars=before 1970. 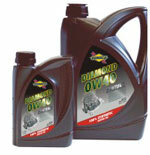 Multigrade motor oil for "Oldtimer and Classic vehicles, with "low" detergency and excellent anti-wear properties. Reduces oil consumption. Motor oil without additives for "Oldtimer" vehicles dating before 1935, with low carbon percentage and good detergency and lubrication properties. Gear oil without additives for gearboxes and(straight or wormwheel) axle-drives of "Oldtimer" vehicles dating before 1935 and if prescribed in the gearbox of "Classic" vehicles dating from 1935-70. Transmission oil with pressure EP properties for gearboxes and (light hypoïdal, straight and wormwheel) axle-drives of "Classic" vehicles after 1935, also for "Oldtimers". Transmission oil for "Hypoïd" axle-drives of "Classic" vehicles after 1960. 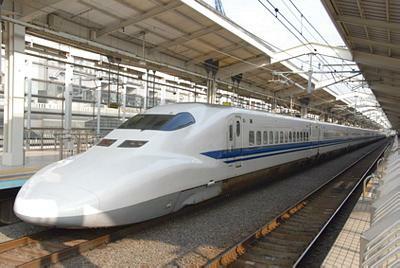 Need to perform for 24 hours endurance at a dazzling speed ? Synturo Racing motor oil is especially formulated to ensure maximum protection and increased horsepower to high-tech performance engines, working under the most extreme racing conditions. This full synthetic racing oil reduces the internal frictional losses to a minimum, providing an exceptional power output, unavailable in any other oil. The premium polymer and additive system controls internal temperature and viscosity for long term durability. Thanks to the excellent anti-wear additives, long term top level performance is assured ! A lot of Sunoco Racing Teams competing on the highest level in rally, on circuits, oval-racing, autocross and many more... prove Sunoco's Synturo Racing 10W60 to be the ultimate racing oil! Imagine the 'explosive' power needed by high-tech drag racing engines to reach the finish within a few spectacular seconds ! Sunoco's Special Racing motor oil is the top quality, high viscosity racing fluid, providing the instant horsepower which is vital for such performances. It assures a 'wet' start and maintains high oil pressure despite high operating temperatures, providing maximum horsepower and protection to the engine working at the highest rpm's. This superb oil is especially designed for racing engines under extreme pressure and to resist breakdown from contamination by special 'explosive' racing fuels. Unmatched quality is proven by several Sunoco Drag Racing Teams ! From start to finish, motorbike pilots ride their bikes at daggers drawn and the maximum is demanded constantly from both rider and machine. 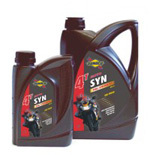 Sunoco's 4T Motosyn engine oil is designed for 4-stroke motorbikes, racing at the highest competition level. This full synthetic engine oil offers unmatched power, protection and flexibility to the high-tech engines in the circuit. Coming out of the curves, full power is needed to overtake opponents at full speed, ensuring victory. Unseen power... Sunoco Power ! Quality is proven by several Sunoco Motor Racing Teams winning their races ! Struggling for an hour through a pile of mud or dust at 30°C or more, may undoubtedly be considered as "extreme" racing conditions! Motor cross pilots know all about it. But next to their talent and skill, unmatched horsepower is needed to jump smoothly from one impediment to another, leaving all opponents behind. Sunoco 2T Motosyn provides this power to take these impediments and competitors without any problems. To exclude air pollution, special oil additives avoid smoke exhaust ! This full synthetic 2-stroke motor oil is of top quality, especially formulated to ensure maximum protection in all weather- and terrain conditions. An engine oil you and the environment can rely on ! Quality is proven by several Sunoco Motor Cross Teams winning their races ! Top pilots often started their career by racing the smallest type of racing : karting. But also in this discipline, all ingredients of 'mature' racing are indisputably present : skill, speed, performance, power and of course the reliability of the machine... Sunoco's 2T Kart is especially designed to fulfill these needs. 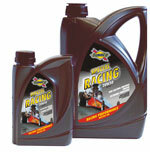 This upper tier full synthetic 2-stroke motor oil with excellent detergency properties provides the power and protection required for high rpm go-kart racing. Next to the "low smoke" properties, selected additives improve lubrication, while anti-oxidation and anti-corrosion additives improve the already high thermal stability. No deposits nor air pollution is to be expected when applying this superb oil! Quality proven by several Sunoco Karting Teams ! 2T Synsnow is Sunoco's full synthetic 2-stroke snowmobile racing oil, providing exceptional lubrication and horsepower at extreme cold winter temperatures. Next to minimizing internal friction, this formula also reduces visible smoke by 50%, meaning less smoke at start-up and while racing at top level. Next to additives that fight corrosion, varnish and wear, special additives help maintain flow and prevent "gelling" in sub-freezing conditions, making 2T Synsnow the perfect snowmobile racing oil. Quality proven by several Sunoco Snowmobile racers. We are all aware that water is most crucial for all life on earth. It is obvious that, during motorized events on this precious water, all environmental risks should be banned. In cases were higher spilling risks appear, such as during powerboat- or jetski racing, the use of Sunoco 2T ECO 2 is thus highly recommended. Besides the ultimate power and protection this premium quality oil provides to the engine, absolute protection of the environment is guaranteed. This full synthetic high biodegradable 2-stroke engine oil can be used for both air- and water cooled engines performing at the highest competition level. Quality proven by several Sunoco Waterski and Jetski Racing Teams. Competing each other in heavy-weight machines such as tractor s and trucks goes far beyond all imagination. These giants of the racing circuit certainly need horsepower like no other! Sunoco Bultrac SS is the oil to protect these 'monster engines' during their battles. This premium quality synthetic blend motor oil reduces the internal friction to a minimum and provides the exceptional power output needed. The stability of the oil film, the resistance against shear and the ever perfect fluidity make this oil the ultimate heavy-weight engine protector for a lifetime ! Quality proven by Sunoco's Tractor Pull Team !